Did you know Harrison Ford wore digital hair extensions in The Force Awakens? Well, that's just one of the awesome tidbits J.J. Abrams gives up during an illuminating director's commentary available on the film's 3D Blu-ray release. It's definitely worth a listen but, if you don't have two hours to kill, we sifted through character motivations, plot teases and behind-the-scenes stories ourselves. Here are nearly 50 fun and/or fascinating facts we discovered about the making of The Force Awakens. 1) In early iterations of the film, Kylo Ren mentioned his mum and dad to Lor San Tekka in the film's first scene. However, it was cut because Abrams didn't want to give the audience too much too soon. 2) The stormtrooper on the right side of the screen when Poe Dameron is captured is Michael Giacchino, the Oscar-winning composer of Up and the upcoming Rogue One. 4) There's a small continuity error when General Hux and Captain Phasma are talking about Finn's escape. Before the shot cuts, Hux quickly turns to his left for no reason. He does that because he's supposed to see Kylo Ren. However, the scene was chopped in half and moved around. The second part of it comes later when Kylo teases Hux about the Clone Army. 5) Steven Spielberg gave Abrams the idea for there to be a sand explosion after Poe and Finn's TIE Fighter sunk on Jakku. 6) Almost all of Finn and Rey's first discussion in the film was reshot because their dynamic hadn't been figured out when they first started filming. Finn lying to her about being in the Resistance, her knowing who Luke Skywalker is, them subtly flirting — that was all added later. Same goes for their fun, friendly conversation after escaping on the Millennium Falcon, which was changed from a more contentious version. 7) Rey saying, "That ship's garbage," only to later reveal the "garbage" is the Millennium Falcon was the idea of producer Bryan Burk. 8) Disney and Pixar's John Lasseter saw an early version of the film and suggested to Abrams that BB-8 have more physical comedy. As a result, Abrams added in the now iconic thumbs-up scene. 9) The idea of Finn knowing the stormtrooper suit specs and that gas could kill them came from Lucasfilm Story Group member Pablo Hidalgo. 11) The planet Takodana is named after Takadanobaba, Japan, a neighbourhood J.J. Abrams visited on his first trip to Japan. 12) Though we see characters standing outside the Millennium Falcon in several locations, the actual model never moved. Instead, the area around the full-size Falcon set was just redressed to look like the different locations it needed to. 13) Han, Rey and Finn's entrance into Maz's castle looks like one long take, but it's actually three shots sewn together. And once we're inside, the only CG element is Maz. 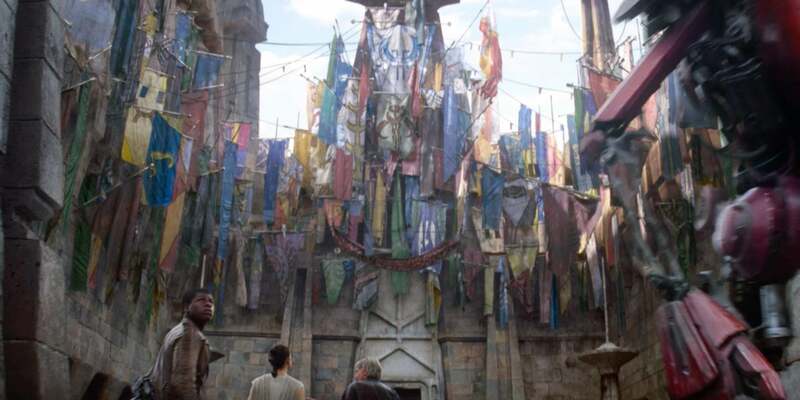 14) Maz was inspired by a teacher both Abrams and production designer Rick Carter had at Palisades High School in Los Angeles, named Rose Gilbert. But Abrams stressed they had a real problem figuring out what Maz's character was going to be, which necessitated a lot of reshoots. 15) In the original script, Maz's backstory was more prominent, although Abrams of course doesn't provide any detail. 16) The original script started not just with Luke's lightsaber falling through space, but it traced the history of where that lightsaber had been and explained how it got to Maz's. "There are other ways we can tell that story later," Abrams teases. 17) Rey's dream sequence, called "The Force Back", saw many iterations. One actually had her seeing Vader and Luke fighting on Cloud City, but ultimately they wanted her to have a more elemental experience filled with things she couldn't comprehend, but were also truthful. Things like the Knights of Ren and her first time on Jakku. 18) Maisie Richardson-Sellers' character, who we only see for a second before she dies during the attack by Starkiller Base, was originally tasked by Princess Leia to go to the New Republic Senate and explain the threat of the First Order. Ultimately, that scene was cut, though it's now on the 3D Blu-ray as a deleted scene. 19) Abrams admits the shot of the TIE Fighters flying in front of the Sun makes no sense lighting or timing wise, but he didn't care cause he loved it so much. It was one of the first concept images shown to him. That's possible, but it's not the only interpretation. Abrams says, "They have never met but he's heard of this girl." Which could mean they have never ever met at all, or could also mean they have never met in this movie. The phrase, "He's heard of this girl," is describing an event that just happened in the film. That suggests the first half the sentence could also be restricted to this one film. They have never met, IN THIS MOVIE, but he's just heard of her IN THIS MOVIE. It's open to interpretation for sure, but I lean toward the latter, simply because it's too big a piece of info for Abrams to slip up on otherwise. And, if he did, they would have cut or rerecorded it. Point being, I don't think anything has been settled on the topic. 21) While walking through the woods to find Rey, Adam Driver apparently tripped over the rocks a lot because he couldn't see through his mask. Abrams said he used the rage to influence the character. Happily, these shots of Kylo Ren stumbling through the woods are on the blooper reel. 22) It was writer Michael Arndt's idea to lose the first Leia scene (mentioned above in #18) because he felt, and Abrams agreed, her reintroduction was more powerful through Han's eyes, on Takodana. 23) In early versions of the film, things were in a different order. The scene with R2-D2 and C-3PO where 3PO explains that R2 is in sleep mode was supposed to happen after the rathtars, but before the deleted Leia scene. Once that Leia scene was taken out, Abrams postponed the R2 and C-3PO scene until after everyone gets back to the Resistance base. 24) The doctor who attends to Chewbacca (played by Dame Harriet Mary Walter) also had a scene where she healed Rey in the film, but that was cut. 25) Originally, Kylo Ren also took his mask off in the scene with Darth Vader's helmet, but he doesn't in the final cut. Abrams doesn't say if that his mask with digitally inserted into the scene or was reshot. 26) The ashes surrounding Darth Vader's mask in Kylo Ren's shrine to his grandfather have been much discussed. Abrams says they're "the ashes of his victims", but whether that means Kylo's victims or Vader's victims is unclear. 27) Abrams confirms they have a whole backstory for the Knights of Ren, which is comforting to know, even if he still didn't give any detail. 28) In the Resistance base, when Han Solo says, "I like this guy," it was originally referring to Poe. They re-edited it so Han said it about Finn in order to continue to develop that relationship. 29) Abrams filmed Han and Leia's goodbye twice. In the first version, he said to her, "There's something I want to tell you," and she replied, "Tell me when you get back." They changed it because they felt it foreshadowed Han's fate a bit too much. 30) In the film, Kylo Ren tells a female stormtrooper that Rey is just beginning to test her powers. It's a scene that was added later to make sure the audience knew what she was doing. 31) Captain Phasma is sent to the trash compactor off-screen because they didn't want to kill the character, but had to get rid of her so as to not complicate the climax. 32) After they lower the shields, it cuts back to the Resistance base where Leia says, "Han did it!" But it was an added line of dialogue so if you watch the film, there's a little distortion over her mouth as she "says" that line. 33) One of the X-Wing fighters at the end of the film was played by Force Awakens trailer editor Stefan Grube, but his helmet was designed by one of J.J. Abrams' sons. 34) After reuniting, Finn asks Rey how she escaped. Originally she just said, "You wouldn't believe it." But Abrams added, "I can't explain it," to give audiences a glimpse into her complicated feelings about starting to use the Force. 35) Both Abrams' father, and father-in-law, are in the Resistance base after Han says they should use the bombs. 36) The inside of the oscillator is just a redress of the Star Destroyer hanger set from earlier in the movie. 37) Like the Leia/Han goodbye, there was a slightly bigger moment the last time Han and Chewie see each other. But, again, it was cut to not make it too obvious what was about to happen. 38) Abrams wasn't sure what he wanted the place Han and Kylo finally meet to look like, so it's one of the only scenes in the movie shot entirely on a green screen. 39) Abrams' commentary track discussion of what Kylo/Ben was feeling when he met with Han on Starkiller Base was revealed last month. But it turns out that Jon Kasdan, son of Force Awakens and Empire Strikes Back screenwriter Lawrence Kasdan, helped write the Solo death scene. Now he's co-writing the upcoming Han Solo movie. 40) The movie needed a moment where a character said there were two minutes until the Resistance Base would be destroyed. So Abrams went into the lobby at Bad Robot and asked the receptionist if she wanted to come next door and be in Star Wars. That woman, Felicia, is the one who says that line. 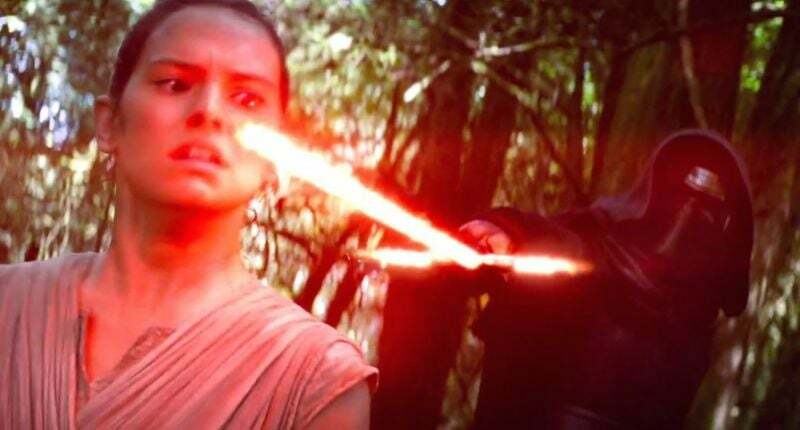 41) Producer Bryan Burk came up with the idea of Luke's lightsaber flying past Kylo and going into the hands of Rey. 42) Watching an early version of the final fight, Steven Spielberg asked Abrams, "Can the trees be falling down around them?" 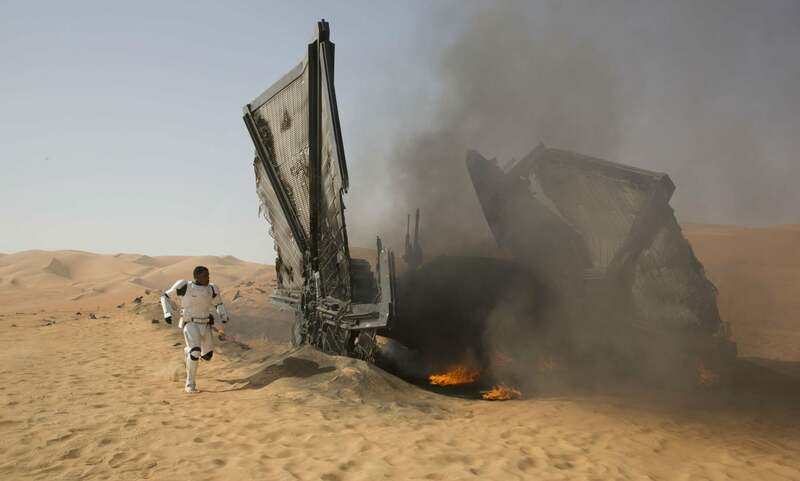 Abrams then asked the visual effects team, who replied, "If you want to pay for it." They did. 43) During the Kylo/Rey fight, when they're right in each other's faces and Kylo says he'll train her, originally she replied, "You're a monster." It wasn't until later, in reshoots, that they added the moment of her closing her eyes and thinking about the Force. 44) Another filmmaker who saw the film early was Selma director Ava DuVernay. She suggested Rey needed just one more big, bad arse moment. So Abrams shot, and inserted, a medium shot of her swinging the saber down at Kylo as per her suggestion. "It connects you to her intensity," Abrams said. 45) Originally, there was some footage of Hux going into the woods to get Kylo Ren and escape, but they didn't feel it was necessary. 46) One big regret Abrams has is showing Chewbacca in the frame walking by Leia at the end of the movie. He admits it's a distraction that he's there and doesn't hug Leia, which he totally would have done after Han's death. 47) On the question of how and why Rey and Leia hug at the end, Abrams says that they knew of each other and were both Force strong. So, even though they'd never met, they were bound by their loss and their strength. 48) In the final scenes where R2-D2 wakes up and reveals the map to Luke Skywalker, he's totally CG.